Sagittarius the Archer, the most Southerly of the zodiac constellations, photographed close to meridian transit from a latitude of 51º.5 North. This is about as high in the sky as Sagittarius gets when seen from Northern Europe, Southern Canada and Southern Russia; observers situated South of latitude 51º.5 North will see more of the constellation, whilst those situated to the North of this latitude will see less. Moving your pointer over the photograph (or clicking here, 269 KB) will reveal the constellation pattern lines, star designations (Bayer [Greek] letters and common names), their apparent magnitudes (shown in brackets), other interesting objects and the line of the ecliptic (along which the Sun, Moon and planets move). Any planets currently located in Sagittarius will be found within a few degrees above or below the ecliptic. Click on the image (or click here, 319 KB) for the full-size photograph, which includes parts of the surrounding constellations of Capricornus, Aquila, Scutum, Serpens Cauda, Ophiuchus and Scorpius. Sagittarius is home to a wealth of interesting astronomical objects. This is mainly due to the fact that, when we look at Sagittarius, we are looking towards the centre of our own Milky Way Galaxy, where the density of stars and gas/dust clouds (nebulae) is greatest. Indeed, the actual centre of the galaxy is located at the South-eastern corner of the constellation, hidden behind dark clouds of interstellar dust, close to the boundary with Scorpius. Under dark skies, the Milky Way glows distinctly in the region of Sagittarius and its neighbour Scutum - an impressive sight now sadly lost to many town and city dwellers due to the effects of light pollution or skyglow (140 KB). Sagittarius has sixteen stars brighter than magnitude 4, seven above magnitude 3 and just one above magnitude 2. The latter is (Epsilon) Sagittarii, whose common name is Kaus Australis (magnitude +1.9). By normal convention this star should be labelled (Alpha) since it is the brightest star in the constellation, however it is one of numerous constellations where this is not the case; this is probably due to an historical mistake in observation, interpretation or translation. Kaus Australis is an unspectacular blue-white star, lying some 85 light-years away from Earth. Not visible in the photograph are the stars 1 (Beta 1) Sagittarii (common name Arkab Prior, magnitude +3.9) and 2 (Beta 2) Sagittarii (Arkab Posterior, magnitude +4.3). They are the Southernmost stars of Sagittarius and are never visible North of latitude 46º North. They appear as a double-star although they are not physically related; at distances of 220 light-years and 130 light-years respectively, their apparent closeness is purely a line-of-sight effect. 1 Sagittarii ( 1 Sgr) does however have a genuine binary companion, but it can only be seen in telescopes. There are no less than fourteen Messier objects within the Sagittarius boundary: seven globular clusters, four open clusters and three gaseous nebulae. Most of these can be glimpsed in binoculars, though a few are visible to the naked eye under dark skies. The Lagoon Nebula (M8 or NGC 6523) is a gaseous nebula with an apparent diameter about the same as that of the Full Moon (0º.5 or 30'). It is visible to the naked eye as a hazy patch of light situated to the East of the star Kaus Borealis. M24 is a rich star field which is part of a wider region of the sky - measuring about 2º by 1º - known as the Milky Way Star Cloud. 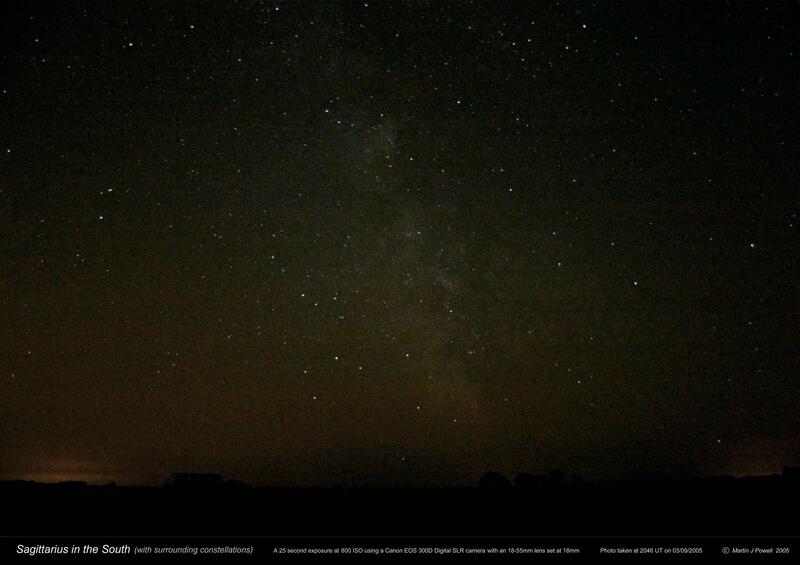 It is one of the most prominent parts of the entire Milky Way and is clearly seen with the naked eye under dark skies. Only a handful of globular clusters in the night sky are visible to the naked eye and M22 (NGC 6656) is one of them. It is easily seen through binoculars, while telescopes resolve the cluster into a beautiful ball of innumerable stars. Finally, M25 (IC 4725) is an open cluster comprising about 50 stars with an apparent magnitude of around 6 and fainter. It is just visible to the naked eye but is easily seen in binoculars. The Mythological origins of Sagittarius are unclear (click for full-size animation, 109 KB). He appears as a centaur (half man, half beast) with his bow and arrow pointed towards the heart of Scorpius, the Scorpion. He may have originated from the Sumerian civilization (of ancient Iraq/Syria) whose archer god of war was named Nergal. Some identify him with Chiron, a wise centaur who was a tutor to Jason (of Argonauts fame) in ancient Greek mythology. Alternatively, he may represent Crotus, who invented archery and hunted on horseback. Sagittarius is the ninth sign of the zodiac, situated between Scorpius (the Scorpion) and Capricornus (the Sea Goat). It is located in the Southern celestial hemisphere, centred on Right Ascension = 19 hrs 5 mins 30 secs and Declination = -28° 27' 18" (astronomical co-ordinates). The constellation covers an area of about 867 square degrees, making it the fifteenth largest constellation in the sky (out of a total of 88 constellations across the celestial sphere). Sagittarius is best observed during the Northern hemisphere summer months (winter in the Southern hemisphere) because during this time the constellation is visible throughout the night and is seen in darkness when it is highest in the sky. Southern hemisphere observers have the best view of Sagittarius, since it crosses almost directly overhead in the sky. In general, the Northern hemisphere has a less favorable view - the visibility of the constellation being worse the further North one is situated. Indeed, the Southern section of the constellation cannot be seen at all from high Northern latitudes (see box at right). How much of Sagittarius is visible from the Northern hemisphere? (click for full-size image, 7 KB) Sagittarius is wholly visible at all latitudes South of 44º North, but not all of the constellation can be seen from the higher Northern hemisphere latitudes. This diagram shows how far South each of the marked latitudes are able to see. At 60º North, for example, the star Ascella barely rises, the Southern half of the constellation being permanently below the horizon. None of the familiar constellation pattern is visible North of latitude 74º North. Sagittarius is not visible all year round because, from the vantage point of the Earth in its orbit, the Sun is seen to pass through the constellation during the Northern hemisphere midwinter period (equivalent to the midsummer period in the Southern hemisphere). Because the Sun passes through Sagittarius, it is by definition one of the twelve (technically thirteen) constellations of the zodiac. Sagittarius is the most Southerly of the zodiac constellations, the Sun being positioned here at the Northern hemisphere winter solstice (the summer solstice in the Southern hemisphere) on December 21st-22nd each year (for more details on the movement of the Sun and the planets through the zodiac - including diagrams of the entire zodiac - see the author's planet movements page). The position of Sagittarius in the sky depends upon the observer's latitude, the season of the year and the time of the day. The following method allows an observer to find Sagittarius in his or her sky at any time of the year, as well as knowing the sky conditions he/she is likely to encounter at the chosen time - whether night-time, twilight or even daylight. However, a few basic concepts first need to be explained. The Meridian is an imaginary line which passes from North to South through a point directly above the observer's head (known as the zenith) (click for full-size image, 7 KB). A celestial body reaches it highest point in the sky when it crosses the meridian; this is known as the meridian transit or culmination. The meridian line is essentially the observer's line of geographical longitude projected from the Earth's centre out into space. Astronomers tracking the motion of a celestial body across the sky use a direction (bearing) along the observer's horizon (known as the azimuth) and an angle above the horizon (known as altitude or elevation). The azimuth is expressed in degrees measured clockwise from 0º (True North) through 90º (due East), 180º (due South) and 270º (due West). Azimuth is typically used for high-accuracy tracking of objects across the sky, e.g. for tracking individual planets or stars, and its value changes rapidly over time. Constellations, on the other hand, cover a relatively wide area of the sky and so there is little need for such high-accuracy measurements; we simply want to know roughly in which direction it will be found. Therefore, for these purposes, direction will be expressed not as an angle but in traditional points of the compass (North, North-east, South, etc.) which are more easily understood across the world, and which also simplifies the calculations required. Sagittarius, like all celestial bodies, reaches its highest point in the sky when it crosses the observer's meridian; this is known as the meridian transit or culmination. This is, essentially, the 'best' time to observe it because it is then largely clear of the haze, turbulence and - in town and city locations - light pollution, all of which adversely affect the visibility of a celestial body when it is near the horizon. The direction an observer faces to observe a zodiac constellation's meridian transit depends upon how high the constellation is positioned above his or her horizon when it transits; in the Northern hemisphere this will typically be due South; in the Southern hemisphere it will typically be due North. The situation is rather more complicated for observers in Equatorial latitudes, however, where most of the zodiac constellations transit at high altitudes (either just to the North or South of the zenith). Angular altitude (or elevation) is measured as 0º at the horizon (when an object is at the point of rising or setting), 45º when 'half way up the sky' and 90º when directly above the observer's head (at the zenith) (click for full-size image, 14 KB). 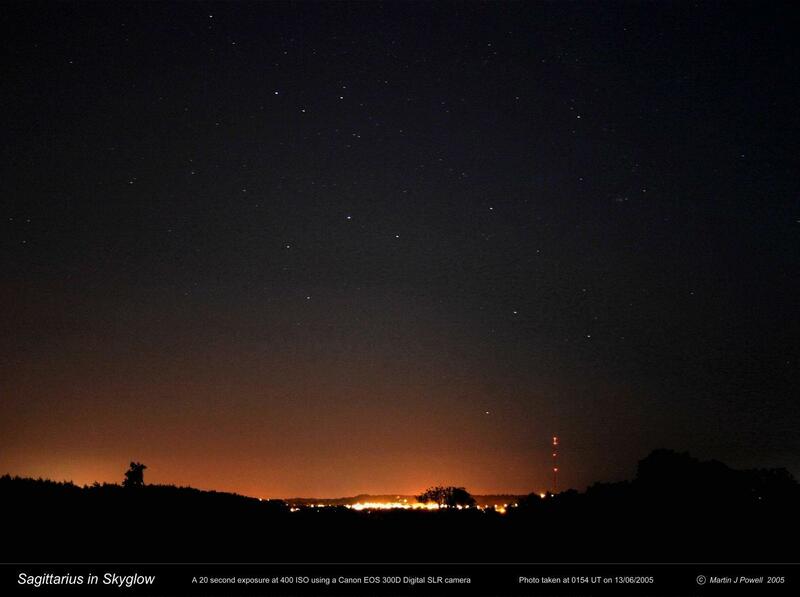 In the above picture, the bright star has an an altitude of about 60º (i.e. it is "60º high"). Note that the altitude is measured from the theoretical (astronomical) horizon, and not from the local horizon, which in many instances will be elevated by mountains, hills, etc. In this image, the mountain itself has an angular altitude, which is dependant upon its distance from the observer. In this case the angular altitude (elevation) of the distant mountain summit is about 10º. Throughout the inhabited world, the zodiac constellations move across the sky in an arc, rising out of the Eastern horizon, reaching their highest point as they cross the meridian and then setting into the Western horizon. Because the path of a zodiac constellation across the sky forms a perfect arc with its apex at the meridian, the time interval between its rising and its meridian transit is the same as that between its meridian transit and its setting. In order to understand the manner in which Sagittarius moves across the sky, refer to the animated graphic below, which shows the event as it appears to an observer situated at the mid-Northern latitude of 40º North (animations can also be viewed for latitudes 60º North, 0º (Equator) and 35º South). 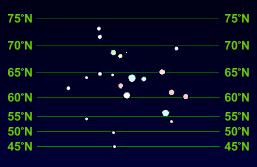 Animation showing the movement of Sagittarius across the night sky as seen by an observer at 40º North latitude (click for full-size animation, Note: 588 KB!). Only Sagittarius is shown in the animation; all other constellations have been omitted for clarity. The directions and altitudes shown refer to a star located on the ecliptic in central Sagittarius, indicated by a small yellow cross (+). The constellation's direction and altitude (Alt) are shown at hourly intervals before Meridian Transit (-1 hour, -2 hours, etc) and after Meridian Transit (+1 hour, +2 hours, etc). If we know the time at which a constellation crosses our meridian on any particular day of the year, we can see where it will be at other times during the night simply by adding/subtracting hourly intervals to/from the meridian transit time (transit times of Sagittarius throughout the year are listed in the Meridian Transit table below). For example, the table tells us that on July 21st, Sagittarius transits at 23:04 LMT (or 00:04 DST, if a Summer Time correction operates in your country at this time of year). Viewed from latitude 40º North, this means it will be due South (on the meridian) at 23:04 LMT, at an altitude of 27º. One hour before transit (at 22:04 LMT) Sagittarius will be in the SSE, at an altitude of 26º; three hours after transit (02:04 LMT) it will be in the SW at 14º high (50 KB), and so on. Knowing the meridian transit time of the constellation on the required date 'locks' the animation into the correct time-frame, allowing us to find the constellation at any time of the night, and to see how it will appear in the sky. Note how, in the Northern hemisphere, the constellations appear tilted (rotated) to the left when they are in the Eastern half of the sky (before meridian transit), upright (North up) when on the meridian (due South) and tilted to the right when they are in the Western half of the sky (after meridian transit). In the Southern hemisphere the constellations appear inverted (South up), the observer facing North to observe the zodiac constellation's meridian transit (see the view at 35º South). Constellations are tilted to the right when they are in the Eastern half of the sky and tilted to the left when they are in the Western half of the sky. In both hemispheres, the tilt angles are greatest at the point of rising and setting. The rising/setting angle of the constellations (measured relative to the horizon) depends upon the observer's latitude. The closer the observer is situated to the Equator (0º latitude) the steeper the rising/setting angle will be. At the Equator itself, constellations rise vertically (i.e. at 90º to the horizon). Conversely, the closer the observer is situated towards the North or South Poles, the shallower the rising/setting angles will be (compare, for example, the above animation with the view at 60º North). Meridian transit times of Sagittarius throughout the year are given in the Meridian Transit table below. The table is colour-coded to reflect the sky colour at the displayed time (because of local seasonal variations, a table is given for a Northerly, an Equatorial (85 KB) and a Southerly (83 KB) latitude - select whichever is applicable to your own latitude). Before searching for Sagittarius, first check that the constellation is visible at the time of year you are requesting. Note that Sagittarius is not visible from around mid-December through to mid-January of the following year, because the Sun passes through the constellation during this period. In order to ensure the visibility of the constellation on the date you require, refer to the Meridian Transit table and check that the constellation's meridian transit time entry on your required observing date has a black background (indicating that it is visible in darkness). If the background colour is a shade of dark blue, it may or may not be visible depending upon the local season and the duration of local twilight. If however the background colour is light blue, it will be daylight and the constellation will not be visible when it crosses the meridian (it may however be visible for a period of time after sunset or before sunrise - details of which, see below). Meridian Transit Times of the constellation Sagittarius for each day of the year, shown in 24-hour clock format (hours:mins) (click for full-size table, 88 KB). All times are shown in Local Mean Time; if your country operates Daylight Savings Time (DST) during the summer months, ADD ONE HOUR to the times shown on the appropriate dates. All positions refer to a star located on the ecliptic in central Sagittarius at Right Ascension 19h 00m 3.485s, Declination -22º 42' 39".56 (this point is indicated in the animations/diagrams by a small yellow cross [+]). The times refer specifically to the central longitude of any given time zone (the time zone meridian); hence for any location on the globe, they will be accurate to within plus or minus (±) 30 minutes. For higher accuracy (to within about 4 minutes), refer to the page Finding the Local Standard Time (LST) from the Local Mean Time (LMT). The table is colour-coded to reflect the sky colour at the displayed time, applicable to latitude 40º North. This table should be used for all observers North of about 15º North; observers between latitudes 15º North and 15º South should use the Equatorial Meridian Transit table (85 KB). whilst those situated South of 15º South should use the 30º South Meridian Transit table (83 KB). Note that the transit times are the same in all of the tables, but the sky colours vary somewhat for each latitude because of seasonal variations. Times in the table apply to the year 2010 but they are accurate for any other year to within ±4 minutes. Although the meridian transit may be the best time to observe a celestial body in our sky, it is not always practical or convenient for us to observe specifically at this time. We wish to find out where the constellation will be at any time of the night - but in order for us to do this, we must first know the constellation's meridian transit time. The Direction and Altitude table below allows us to find where Sagittarius will be at times other than at meridian transit. It presents the same information as in the above animation, but in tabular form, and for several latitudes. It gives the compass direction and altitude of Sagittarius at hourly intervals before meridian transit (column BT) and after meridian transit (column AT). To use the table, first take the meridian transit time for the current day from the Meridian Transit table above (remember to add one hour to the time if DST is in operation), then find the time interval between your intended observing time and the constellation's meridian transit time (in hours). Then determine whether your intended observing time occurs before or after the constellation's meridian transit time during that night. Look along your latitude entry in the table, locate the appropriate column showing the number of hours difference, and look down the sub-column BT (if your observing time is before meridian transit) or AT (if your observing time is after meridian transit). The resulting entry gives the direction and altitude of Sagittarius at the time and latitude you are requesting. Direction and Altitude of the constellation Sagittarius at hourly intervals before/after Meridian Transit, for a variety of latitudes (click for full-size table, 44 KB). All positions refer to a star located on the ecliptic in central Sagittarius at Right Ascension 19h 00m 3.485s, Declination -22º 42' 39".56 (indicated in the animations/diagrams by a small yellow cross [+]). Abbreviations used in the table are as follows: BT - Before Meridian Transit; AT - After Meridian Transit; Alt - Altitude (angle) above the horizon (rounded to the nearest whole degree). All altitudes are positive (+, i.e. above the horizon) except where indicated with a negative (-) sign (at rising or setting). The altitude shown applies for both BT and AT; (R) - the constellation is Rising; (S) - the constellation is Setting and - (hyphen) - the constellation is largely or wholly below the horizon. Tracking the position of Sagittarius across the sky on August 12th at Latitude 50º North (click for full-size table, 30 KB). Sky colorations at Rising and Setting (4 hrs BT and 4 hrs AT) were obtained from the Rise/Set table below. We can therefore decide our observing time based on the times and positions we have determined. Alternatively, we can start with an intended observing time and find the constellation's position based on the time offset from its meridian transit. Say for example we wish to observe at around 23:30 DST (11.30 pm) on our chosen date of August 12th. We know the meridian transit time on this day is 22:35 DST, so this is a time difference of (23:30 - 22:35) = 55 minutes, which we can round up to 1 hour. Our intended observing time (23:30 DST) is after the constellation's transit time (22:35 DST). Hence under our latitude of 50º North, we look up the column 1 hour and the sub-column AT (After Transit) which gives us our answer: Sagittarius is in the SSW (South-South-West) at around 16º high. Finally, refer to the animation appropriate to your latitude to see how the constellation will appear in the sky (whether tilted left or right from vertical) at the time you have chosen. Occupying the Southwestern region of Sagittarius is an asterism (star pattern) commonly called 'The Teapot', which includes the constellation's brightest stars (click for full-size image, 10 KB). Three of the stars form the Archer's bow: these are Kaus Borealis, Kaus Medius and Kaus Australis. The word 'Kaus' is Arabic for 'bow'; the remaining parts of the names are Latin for 'northern', 'middle' and 'southern', respectively. It is worth noting that, because the Earth moves in its orbit at a rate of about 1º per day, the stars and constellations rise, transit and set about four minutes earlier on each successive day. This is evident by examining the meridian transit times in the Meridian Transit table (the planets, on the other hand, move slowly against the 'fixed' star background, so this rule does not apply to them in the strictest sense). Consequently, on August 13th (one day after the 12th) Sagittarius will appear in the same directions and altitudes as we determined above, but four minutes earlier than the times on August 12th. Therefore, on August 13th at latitude 50º North, Sagittarius will appear in the same position in the sky (16º high in the SSW) at (23:30 - 00:04) = 23:26 DST, and four minutes earlier on each day thereafter. At 50º North latitude, around 4 hours before/after transit, we see that the constellation is in the process of rising/setting, respectively. Precise rising and setting times of Sagittarius, together with sky colorations, are given in the table below. The following table lists the rising and setting times of Sagittarius for a variety of latitudes (times are listed for the 1st, 11th and 21st day of each month - to obtain the times at intermediate dates, apply the 'four minutes per day' rule discussed above). The times displayed are in Local Mean Time (LMT); ADD ONE HOUR to the times if your country operates Daylight Savings Time (DST) during the local summer months. Rising and setting times of the constellation Sagittarius, listed in 24-hour clock format (hours:mins) on the 1st, 11th and 21st day of each month (click for full-size table, 171 KB). To determine the times for intermediate dates, note down the times on the previous listed date and SUBTRACT FOUR MINUTES FOR EACH SUCCESSIVE DAY through to the required observing date. For example, if we require the rising time of Sagittarius on April 18th at Latitude 50º North, we take the time for the previous listed date (the 11th, i.e. 7 days before the 18th) and subtract (7 days x 4 minutes) = 28 minutes. Hence the rising time on April 18th is (01:38 - 0:28) = 01:10 LMT. All times are shown in Local Mean Time; if your country operates Daylight Savings Time (DST) during the summer months, ADD ONE HOUR to the times shown on the appropriate dates. The times refer specifically to the central longitude of any given time zone (the time zone meridian); hence for any location along these latitudes, they will be accurate to within plus or minus (±) 30 minutes. For higher accuracy (to within about 4 minutes), refer to the page Finding the Local Standard Time (LST) from the Local Mean Time (LMT). The sky colour codings are the same as those described under the Meridian Transit table above. A negative sign (-) after the time refers to the previous day whilst a plus sign (+) after the time refers to the following day. Times apply to the year 2010 AD but they are accurate for any other year to within ±4 minutes. All the above times were obtained from the commercial software Redshift 5 . Astronomical and mythological details were obtained from the following publications: "The Guinness Book of Astronomy Facts and Feats" by Patrick Moore (Guinness Superlatives Ltd., Enfield, 1983), "Collins Guide to the Stars and Constellations" by Ian Ridpath and Wil Tirion (Collins, London, 1984), "Concise Guide to Constellations" by Josef Klepešta and Antonín Rükl (Paul Hamlyn, London, 1969), "Dictionary of Astronomical Names" by Adrian Room (Routledge, London and New York, 1988) and "Observing the Constellations" by John Sanford (Mitchell Beazley Publishers, London, 1989). Star colours were based on those shown in "Patrick Moore's Colour Star Atlas" (Mitchell Beazley Publishers Ltd., London, 1973). The rising, transit and setting times of Sagittarius were obtained from RedShift 5 by Maris Technologies Ltd. Sky colorations were determined using the software's 'True Sky Color' feature. The centaur image of Sagittarius was reproduced from "First Steps in Astronomy" by P. F. Burns (Ginn and Company Ltd, London, 1942). The colour (3D) Sagittarius zodiac sign (The Archer's arrow) was obtained from the free graphics site .